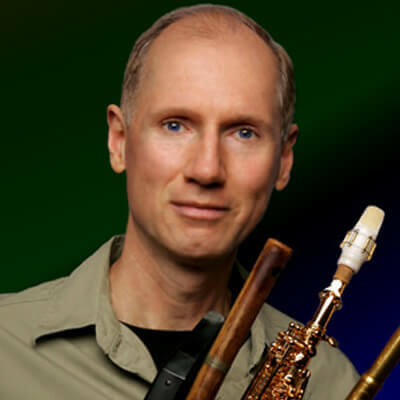 A composer, arranger, producer and an accomplished multi-instrumentalist who performs on various flutes, soprano, alto and tenor saxaphones, wind synthesizers, and lap steel guitar. Premik has worked with everyone from Carlos Santana, Whitney Houston, Herbie Hancock, John McLaughlin, Ravi Shankar, Narada Michael Walden, Clarence Clemons, Ornette Coleman, Jackson Browne, Jean-Luc Ponty, Lonnie Liston-Smith, Scarlet Riveria, James Taylor, Sting and Lady Gaga just to name a few. He is equally adept in pop, R&B, Jazz, World and experimental genres. He has performed numerous times at Carnagie Hall, recorded with grammy artists and is the son of big band arranger and trumpet/flugelhorn artist Harry Tubbs.